Robert Duncan McNeill is an actor, director, and producer, best known for his role as Starfleet Lieutenant Tom Paris on Star Trek: Voyager . Robbie (as he is known to his friends and family) was born in North Carolina and was, as he put it, "a corporate brat," on the move with his family for some years until they finally settled in Atlanta, Georgia. There he got his first taste of acting at the age of twelve by performing in a little theatre production of "The Wizard of Oz." Robbie found his niche in the theatre, and pursued acting opportunities throughout his adolescence, performing in local community theatre productions and on PBS shows. Eventually, he won a bit part in the Burt Reynolds film, Sharkey's Machine ,which was produced on location in Atlanta. After completing high school, Robbie moved to New York City and Broadway, successfully auditioning for the role of "The Boy" for a national touring company of The Fantasticks. Further success was slow to arrive, however, and Robbie enrolled at the Juilliard Conservatory, where he spent two years studying the trade. It was while he was attending Juilliard that Robbie was cast as Charlie Brent on the popular ABC daytime drama All My Children , performing the role from 1985-1988, and earning himself a 1988 Daytime Emmy nomination for his acting. During this time he also produced and starred in the New York premiere of Sam Shepard's The Four-H Club on off-Broadway, and starred in the science fiction feature film Masters of the Universe with Dolph Lundgren, Courteney Cox, and Frank Langella. After leaving All My Children , Robbie landed the role of "Jack" in the national touring production of Stephen Sondheim's hit Broadway musical Into the Woods and then joined the cast of Lucy's Lapses , an off-Broadway play. During his spare time, he assisted his wife Carol with Real Play Productions, an organization founded by Carol McNeill to provide inner-city school children with creative experiences such as improvisational acting, dance, and music, all designed to help the children with the harsh issues confronting them in their lives. Robbie soon returned to Los Angeles to star in the Daytime Emmy Award Winning ABC After-School Special Flour Babies , directed by Linda Lavin. During this time he also appeared in the Coast Playhouse production of Child's Play with Gregory Harrison. Robbie then took on the featured role of "Rick" in the Broadway production of John Guare's Six Degrees of Separation , which starred Stockard Channing and Courtney Vance. Robbie performed in Six Degrees for over a year to critical acclaim. Robbie and Carol eventually settled in Los Angeles for good, and Robbie soon began to appear as a frequent guest star on television shows. His roles include appearances on such series as Murder She Wrote , Quantum Leap , LA Law , and of course, Star Trek: The Next Generation (in an episode entitled "The First Duty"). Robbie then landed a starring role in the ABC series Going To Extremes , playing a medical student studying on the mythical Caribbean island of Jantique. His credits also include a recurring character on ABC's Homefront , and a role on the CBS nighttime soap opera Second Chances with Connie Selleca. He also appeared as Romeo in Romeo And Juliet at the LA Shakespeare Festival, where he earned a DramaLogue Award as Best Actor. A year later, Robbie was performing in the off-Broadway production of The Family of Mann when he was called to Los Angeles to read for the part of cashiered ex-Starfleet officer Tom Paris. Robbie convinced producers Rick Berman and Michael Piller he was right for the part, and Robbie soon joined the cast of Star Trek: Voyager as the ship's headstrong conn officer. Robbie made his directorial debut on Voyager with a third season episode entitled "Sacred Ground," filmed in 1996 during the second season. He then followed up that success by directing one of the third season's most popular episodes, "Unity," which marked the return of the Borg to the Voyager universe. Since that promising start he has gone on to direct other episodic television, as well as directing and producing his own independent film projects. In 1998, Robbie completed production of his short film The Battery , which he co-wrote, produced, and directed. Starring fellow Voyager cast member Ethan Phillips and Dawson's Creek star Joshua Jackson, The Battery has been selected for showing by several film festivals, including the New Orleans Film Festival, the Newport Beach Film Festival and the Canyonlands Film Festival. In September, 1999, the New York International Independent Film Festival gave "The Battery" its Best Short Film award for its annual fall series, and selected the film for inclusion in its Spring, 2000 showcase in Los Angeles. Robbie directed his third Star Trek: Voyager episode, "Someone to Watch Over Me" in that same year, winning accolades from both producers and critics for his work on the episode. He also directed an episode of the Nickelodeon series The Journey of Allan Strange. On the performing front, Robbie made a rare guest-starring appearance on the CBS series Early Edition, sharing the screen with his old Homefront co-star, Kyle Chandler. In the year 2000, Robbie completed production on his second independent film, "9mm of Love," and directed a fourth Star Trek: Voyager episode, "Body and Soul." "9mm of Love," featuring Cagney and Lacey's Carl Lumbly and Robbie's co-star Ethan Phillips, premiered at the Sun Valley Film Festival in October, 2000, and was selected for showing at the Slamdance Film Festival and the HBO Comedy Arts Festival. Soon after, the SciFi Channel featured "9mm of Love" on its "Exposures" showcase for short films. 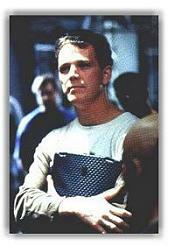 On May 23, 2001, the final episode of Star Trek: Voyager aired, closing Robbie's seven-year tenure in the role of Tom Paris. Producers of the independent film Infested immediately cast Robbie in a featured role. Soon after, Robbie guest-starred on an episode of The Outer Limits, and then assumed the director's chair on the set of Dawson's Creek. In the fall of 2001, Robbie returned to Paramount to direct Enterprise, the fifth entry in the Star Trek franchise. In 2007, Robbie became the producing director on Chuck, the critically acclaimed NBC comedy-adventure series about reluctant CIA agent Chuck Bartowski. Now an executive producer, he continues to direct multiple episodes of Chuck. Robbie currently resides in Los Angeles with his wife and children. This biography, and the accompanying credits, are © 1997-2010 Deborah C. Stone. They may not be reproduced without permission of the author.